If you’re thinking of publishing video content on your blog then that’s certainly a step in the right direction. However when you actually sit down and start to brainstorm what type of video content you may end up coming up blank. While there are so many different types of video content that you could conceivably create for your blog – some have been known to perform better than others. In much the same way that ‘How to’ articles appeal to readers, tutorials do too. For this kind of content it is important that the topic helps the viewer to solve a particular problem or teaches them to perform a task that they deem valuable – and the steps on how to do so should be presented as clearly as possible. Seeing as it is a video, it is important to ‘show’ how to perform each step. Probably the most easily monetized type of video content would have to be product reviews. Nowadays there are several types of product reviews that tend to be popular, including ‘unboxing’, ‘demos’ and more in-depth reviews. If you are creating a product review just remember to be honest about both the pros and cons – otherwise your audience may be turned off. Finding good interviews to use as video content can be difficult – but assuming you can find an expert to interview on topics related to your niche then that could be a really great video. Rather than conducting a face-to-face interview you could do so on Skype and record it using screen capture. The reason why Q&A sessions are a particularly interesting type of video content for blogs is because they encourage audience participation. If you’re holding a Q&A session on a live stream then the audience can participate directly and ask questions – but even if not you can have them submit their questions in advance and then produce a video that answers them one by one. As its name suggests, an ‘explainer’ video is basically just a video that explains a particular topic. It differs from guides and tutorials as it doesn’t really show someone how to perform a task, but rather discusses a topic and dissects it. That being said a good explainer video should be methodical, and ‘guide’ the audience through the topic so that it is easy for them to follow the explanation. If you’re using your blog to promote a product or service then testimonials will be an extremely important type of video for you to publish. Essentially testimonials of any kind help to provide social proof of how good your product or service is, and it carries more weight in the form of a video where the audience can actually ‘see’ the people who are providing the testimonial. Now that you know the types of videos that perform great on blogs you should have a place to start, and probably even have several ideas kicking around for your first video. 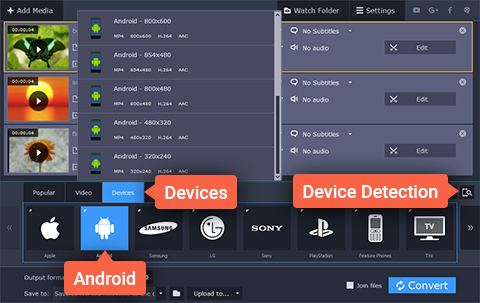 Just remember that quality is important, so you will want to use a converter such as Movavi Video Converter to make sure your video is in the right format – and maybe use its other features to cut, edit, and improve it in various ways. By producing the right type of video content and publishing it on your blog you could tap into a wellspring of traffic, increase engagement levels, and really start to see your conversions skyrocket. Make no mistake while it might seem like it requires a lot of effort to really harness the power of video content – it is well worth it in the long run. Assuming you keep publishing high quality content on your blog, you’ll definitely strike gold sooner rather than later.